Looking for a little privacy at work? Considering installing blinds on your windows? Before you draw the curtain on natural light, take a look at window films. 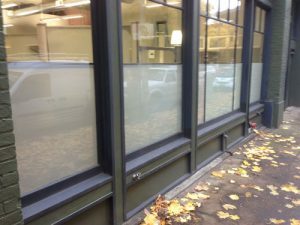 Films offer many of the benefits of window coverings while eliminating some of the downsides. An office with a view is a great perk. But sometimes an unobstructed sight line is too much of a good thing. If you can see out, everyone can see in. While blinds keep people from peering in, they are an all-or-nothing solution. Window films provide discreet privacy without cutting you off from the world. With window film in place, your meetings are private. Visual distractions are minimized. Some tinted films are barely perceptible from the inside, but reflect the view from the outside. For further privacy, you can choose film with more tint. Even if your film is frosted or decorated for maximum privacy, it lets light in while reducing the glare that makes computer work difficult. Blinds create privacy, but they also block the light. 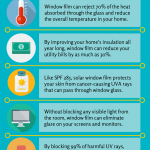 Here are some other ways window film out performs blinds. 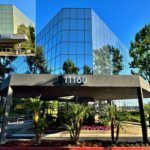 Window film can be customized for your office decor. You can add a company logo to window film. Custom graphics can include images and text. Film can be tinted with the color of your choice. It can look like traditional frosted glass or ornate stained glass. Some of the best designs are sleek and modern. While blinds come in different colors, they can’t match the varied potential of window film. Window film is easy to maintain and quick to install. A professional technician can quickly and easily cover your windows. Clean your windows as you normally would. No further upkeep is required. Blinds collect dust and dirt. The individual slats are difficult to clean. The strings become tangled and the wands can malfunction. Blinds aren’t difficult to hang, but installation is more involved than applying window film. Window films are more economical than blinds. The initial investment for covering windows with film is less than if you were to purchase blinds. Both blinds and film help reduce energy use by keeping out the sun’s heat, but film controls temperature more effectively than shades. Window film can block up to 77 percent of solar energy, reducing the need for air conditioning. Contact us to learn more about our film and custom graphics.